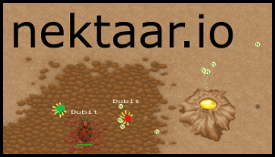 nektaar.io | Play nektaar.io free on iogames.space! Navigate procedurally generated mazes in search of Nektaar. Gather nektaar to increase your score or feed your nests and progeny. Be aggressive and acquire nektaar from other players or seek out unclaimed nutritious areas as your breeding grounds. Featuring resource management, survival, nest-building and A.I.-controlled minions. your bug will walk towards your cursor when moving. tap terrain once to walk to that location. double-tap the terrain to shoot. use the buttons that are available. use joystick pad for movement. single-tap terrain with another finger to shoot. Nektaar.io is designed and optimized for mobile web. works best in chrome. You are a bug and get given a random name. You must feed, nest, breed and inevitably, protect your precious nektaar from other bugs. Player bugs have yellow legs while A.I. controlled bugs (underlings) have blue legs. Your bugs are green while enemy bugs are red. At the bottom right there is a timer. When it runs out, you need to eat. If you don't have nektaar on you when it is time to eat, you will lose one health. If you do however have nektaar you will gain back lost health. You also use up one nektaar each time you shoot. 1 nektaar = 1 nektaar-projectile. For every nektaar you carry, you get bigger, move slower and have to eat nektaar more frequently (the eat timer will run out faster). Your score is made up of 1 point per nektaar that you own, plus 12 points per nest that you have killed plus 4 points per underling that you have killed plus 100 points per relic that you own. You also gain a half of a player's points when you kill him. A game instance lasts 14 minutes after which it ends and the scoreboard is shown. Gather 20 nektaar in order to build a nest. Nests automatically build underlings that gather nektaar or fight for you. When your nest is fully built, you can climb in to it by walking up to it. When inside the nest, you have an overview of the map. In the nest you can change the way your underlings behave. You can also store extra nektaar in your nest, or pick up some if you are running low. Relics appear at random places on the map. The more players in the game, the more relics will appear. A relic gives 100 points, gives 2 health when eating/healing and adds an extra health slot. Relics come in different colours, and each colour has a unique special ability. You can own multiple relics by storing them in your nests. Only one relic can be stored in a single nest. Drop nektaar to become faster in order to escape an enemy, or to feed nearby underlings in need of nektaar. Building your nests close together makes them easy to defend, but they will struggle with income. Spreading your nests out will cover more area for your underlings to gather. If you have more than 20 nektaar, your shots do double damage. IIf you have more than 30 nektaar, your shots penetrate with 1 damage and you gain 2 health when you eat. The moreyour score, the bigger your shots become. The bigger shots make it easier to hit your targets. Underlings also require nektaar for sustenance and to be able to shoot. 1 nektaar = 1 nektaar-projectile. An Underling does double damage if it has 2 kills and has penetrating shot if it has 3 or more kills. When a nest is destroyed, it's underlings will wonder around aimlessly. Underlings need a nest to function. In a nest you gain two health when its time to eat, and the nest wont let you die of hunger if it has nektaar. A nest will automatically retaliate when attacked. The attacker cannot dodge the shot fired from the nest. You can gain back health faster than a nest. Use this to your advantage when engaging one. When in a nest you gain two health when its time to eat, and the nest wont let you die of hunger if it has nektaar. Changing the objective of a nest changes the behavior of the underlings that belongs to that specific nest. There are three different behaviors: Gathering, attacking and following. You can heal your nest or underling by shooting them. Underlings set to gathering will defend and bring nektaar back to the nest. They will prevent enemy nests to be built close by. If an enemy attacks one of the underlings in the vicinity of the nest, other underlings from that nest will come help fight, even if they are set to gathering mode. Underlings set to attack will search for enemies at locations where they were last spotted. If there were no enemies spotted, they will just wonder around. Underlings set to follow will follow you as you move around the map. They will attack enemies that come in to range. Make sure to feed your underlings by dropping them some nektaar: underlings set to follow might die of hunger because they will follow you instead of finding nektaar. The game is still in beta and will undergo various patches for changes in game play and balance. Version 0.842 Beta - 28-JAN-2019 - Added relic abilities. Green relic = speed boost, Cyan relic = more damage, Yellow relic = shoots projectiles out around you, magenta relic = shoots homing shots like a nest. Does 2 damage to nearby enemies and 1 damage to far away enemies. Version 0.83 Beta - 27-DEC-2018 - Sound and music has been added to the game. You now automatically start moving at the beginning of a game. Nektaar spawn rate for small and medium craters have been doubled. Nektaar spawn rate of small craters are now constant (they used to be variable) A nest can now store up to 50 nektaar. (used to be 40). The first relic will appear after a shorter amount of time. More A.I. nests. One of the starting A.I. nests is set to attacking, for more action while playing solo. player will now always eat from nest nektaar if in a nest and he has no nektaar on him. Version 0.821 Beta - 12-DEC-2018 - the diameter of your bullets = 20 + sqrt(80*yourScore) / 8 pixels. penetrating bullets now do a guarenteed 2 damage upon hit, and will do 1 additional damage for consecutive hits on the same target. Underling max nektaar capacity reduced from 4 to 3. Underlings now take 2 nektaar from the nest when they exit the nest and are set to attacking or following. (used to be 3). An Underling now does double damage if it has 2 kills and has penetrating shot if it has more than 3 kills. Underling build time increased from 20 seconds to 28 seconds. Players now start with 8 nektaar instead of 12. killpoints for killing a player is now a quarter of the killed player's points. nektaar is now easier to pick up (increased range at which it is picked up) made a very slight extra reduction in speed when you have more than 20 nektaar. Shooting your own units now heal them. Game now does not redownload every time. Fixed minimap-bug where the minimap was not positioned correctly. Version 0.819 Beta - 04-DEC-2018 - Shots now penetrate and do 1 damage if you have more than 30 nektaar. You also gain two health points when you need to eat and you have more than 30 nektaar (previously was more than 20 nektaar). You now also gain points for killing players, nests and underlings. The more things you kill, the bigger your shots become, making it easier to hit things. Removed bonus points from end game score screen and added kill points. Version 0.816 Beta - 30-Nov-2018 - Updated server code to remove stale connections which was making the game load slow. Fixed an issue where sometimes objects would not load correctly when in nest view. Version 0.813 Beta - 29-Nov-2018 - Double damage and double heal if you have more than 20 nektaar (was 39). Game instance length decreased from 20 minutes total to 14 minutes total. Relic spawn rate decreased. map size decreased to 26 from 30.